This species from Japan grows to a medium size about 15 inches high and 47 inches wide. 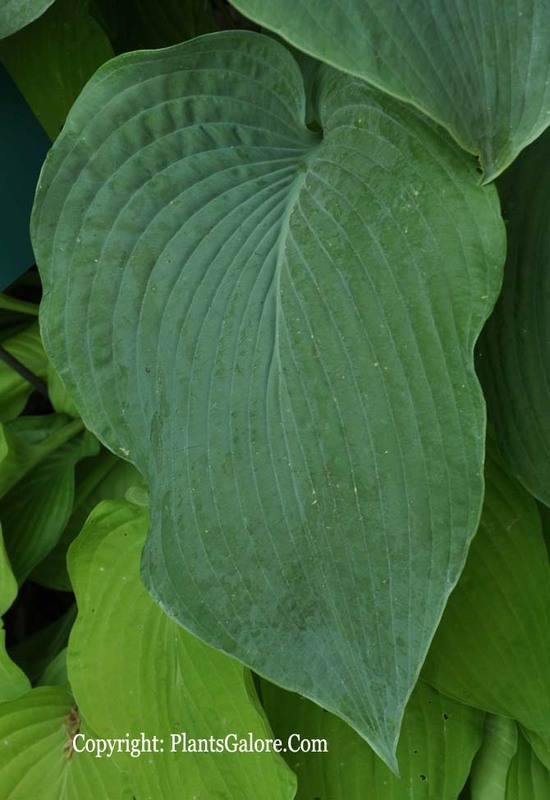 The leaf is deeply lobed at the base with a curled tip and slightly rippled margins with thick substance. One of the featured traits is the curve petiole with dark reddish purple dots. Pale lavender, funnel shape flowers with dark purple anthers bloom from late July into August. It produces viable seeds. 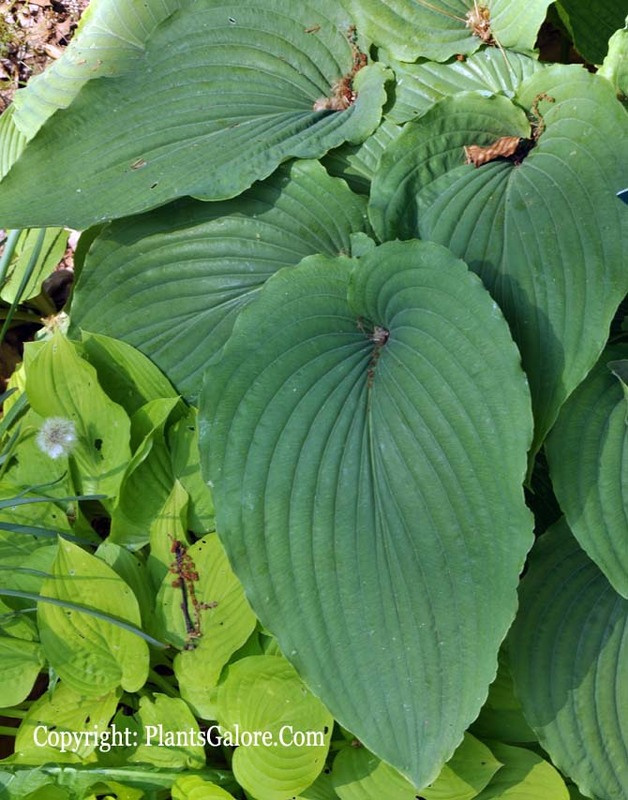 The Genus Hosta by W. George Schmid (1991) says the name in Greek translates to "hypo = back, beneath and leucon = white color." This plants gray-green leaves have long points at the tips and are whitish colored on the bottoms. This species is native to Japan, where it has adapted to growing on cliffs and rock faces. The white underside of the leaves is thought to help reflect the heat from the rocks. Schmid points out that "In Japan it is often used in elevated pots to show the very white coating of the leaf underside or to provide an accent at the entrance to the garden." 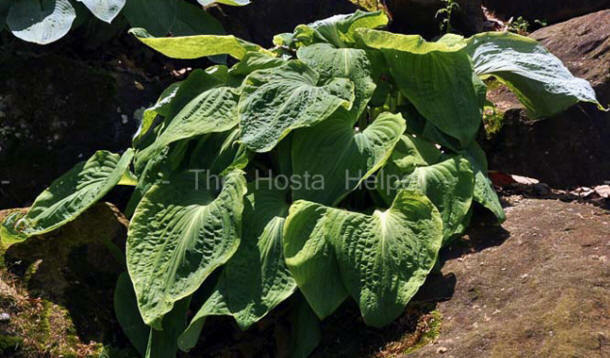 According to The Hostapedia by Mark Zilis (2009), "...ranks as one of the most unusual of the forty or so hosta species...proven to be a superior breeding plant..."
The New Encyclopedia of Hostas by Diana Grenfell (2009) states: "Changes in characteristics more than any other species when grown in cultivation...Much used in hybridizing for introducing thick pruinose coating to the backs of leaves." 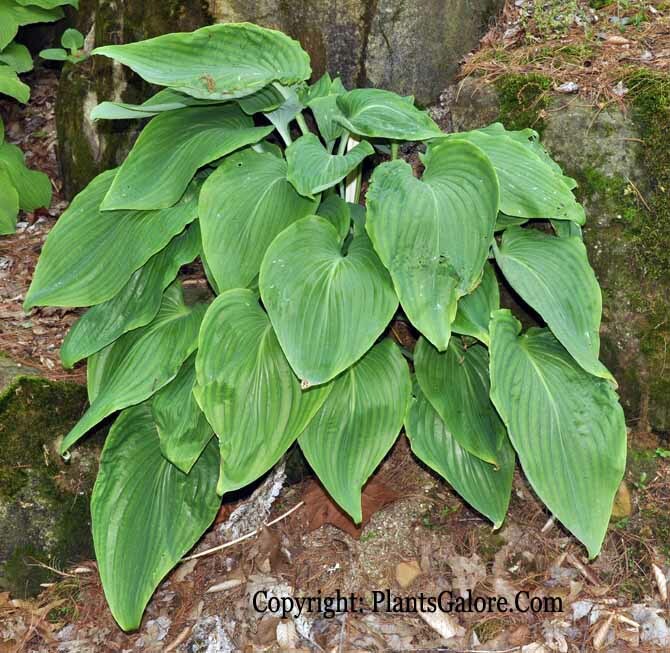 Mark Zilis' Field Guide to Hostas (2014) states that this species was found in Japan on "...rocky cliffs..."
An article by Hajime Sugata of Japan in The Hosta Journal (1994 Vol. 25 No. 2) states that "H. hypoleuca does not grow anywhere in Japan except near Chiwa Rock, Mikawa Kawai, Horai Town in Aichi Pref. The area is small, within a 2 km (1.25 mile) radius around Chiwa Rock. H. hypoleuca hangs under direct sun on dry rocks as well as water-dripping cliffs. Plants on the sunny side are larger and grow healthier than ones in the wet side. ...H. hypoleuca is attractive and people like to pick them. Thus, unfortunately, their numbers are decreasing. A regionally modified form, a yellow-streaked form, has been found."